This is a ministry of fellowship and community. Those involved help coordinate Parish Potluck Lucheons, Sunday Coffee, Receptions, Summer Lemonade, Parish Picnics and Cookouts, just to name a few. Our purpose is to bring the people of St. Martin’s together for conversation and fellowship. Being a part of this ministry is a wonderful a way to meet new people. There is always need for volunteers to help plan, set up, clean up or bring items. Sign up today to be on a rotating list of volunteers or contact the Parish office for details. Advent Wreath Making: On the first Sunday of Advent parishioners gather to assemble and create advent wreaths as we prepare for the coming of Christ. Fellowship Hour: During the program year we gather after the 10:00 a.m. service for coffee and donuts. In summer it’s time to gather outside, weather permitting, for the simple refreshment of lemonade and cookies. Family Club: This group sponsors exciting activities where everyone is welcome. 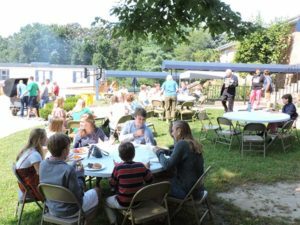 Events include the annual Parish Picnic and Games as summer begins, Family Bingo, Christmas Caroling, the camp out, and a host of other opportunities for families of all ages to come together. “Meet & Eat” Summer Cookouts: All are welcome to join us for BBQ on Wednesday nights at 6pm in June, July, and August. 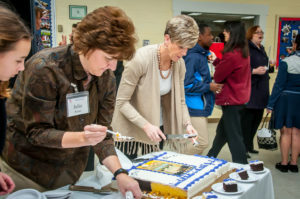 Reception Coordinator: Each year, we celebrate our newest confirmands and our newest members with receptions between services. Welcome Committee: St. Martin’s has an open door for all people. With new welcome cards in all of the pews and an enthusiastic Welcome Committee in place, our hope is that joining our church family is easy. Contact Sarah Parkison.